Vancouver, BC—WESTCOAST Sightseeing is thrilled to announce its newest remarkable west coast tour experience aboard electrically powered, 10-passenger boats hosting unique and intimate tours of Vancouver’s spectacular Coal Harbour, Stanley Park and Canada Place. “Electric Harbour Tours” will open in May with two boats: Elektra One and Elektra Two, with two more boats slated for delivery by summer. 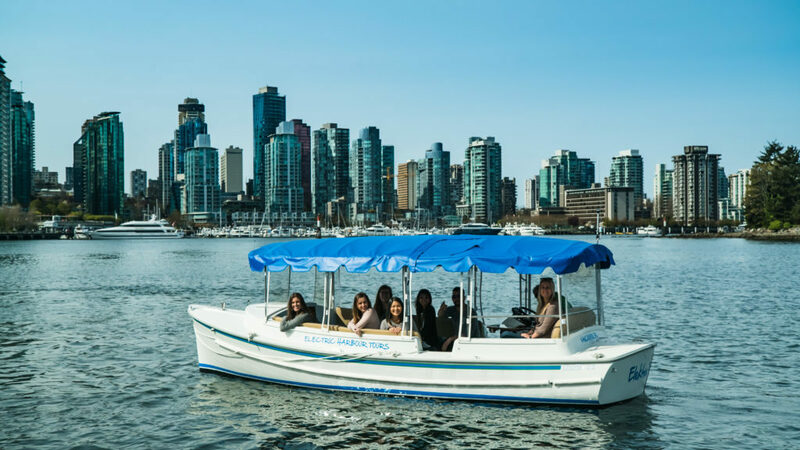 Electric Harbour Tours’ first offering will be a Coal Harbour e-tour, departing from Harbour Cruises’ marina, just west of the Westin Bayshore on Coal Harbour. The 45-minute, narrated tours will dive deep into Vancouver’s history, sharing facts about architecture, landmarks and Indigenous history. The electric vessels are ultra-quiet and will sail past Coal Harbour, Stanley Park and the Port of Vancouver providing passengers with stunning views of the North Shore mountains and Vancouver City skyline and amazing front row seats to watch landing and departing seaplanes, cruise ships and resident seals, herons and other wildlife. The new boats are 100% electric with lead-acid batteries holding a 10-hour charge and will receive a boost charge while docked. The luxuriously appointed boats were manufactured by Duffy Boats in California who have specialized in electric boats for over 40 years. Duffy Boats are used world-wide and are the vessel of choice for the environmentally stringent California Fish and Game Department for the exploration of sensitive marine habitats.